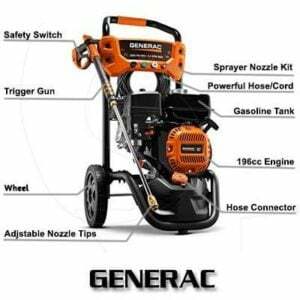 Generac 6922 2800 PSI 2.4 GPM Pressure Washer is one of the best gas powered pressure washer that has gained the faith. It provides good service to all its users over a long period of time. The device delivers 2800 PSI of water pressure along with 2.4 GPM water flow. The water pressure that the device provides is very close to a commercial pressure washer. For residential use, the pressure you will get will be more than enough. You don’t have to worry anything about doing a tough job. For easy access hose connection and durability, Axial Cam Pump has been used in the machine. The device gives you easy mobility by its 10” never-flat wheels and the four quickly changeable nozzle tips give you a different touch in your cleaning. This device is run by gasoline you don’t have to think about the electricity. You can take it anywhere you want for cleaning purpose even if there is no electricity. If you combine all the facilities you will get out of it, the price will seem pretty less. So check all the features and the good sides of this device before you make the purchase. The device uses Powerful Generac 196cc horizontal shaft OHV engine for the best performance and longer life. Sometime it becomes annoying to connect the hose to the pump as the connections are not smooth. It uses an Axial Cam Pump to connect the high-pressure hose with the pump easily that saves your valuable time. The pump is put well above the ground at the same level as the engine so that you don’t have to lean on the ground. For your easy carriage, Generac 6922 2800 PSI 2.4 GPM Pressure Washer has on-board storage for the hose and the spray gun. Its on-board detergent tank helps you to carry the detergent easily and the high-pressure hose tolerates the water pressure easily. There is a pro-style spray gun. It has a very comfortable grip so that it doesn’t slip from your hand when you use it. Along with the pro-style spray gun, you will get 4 different quickly changeable nozzle tips that include 0-degree, 25-degree, 40-degree and a soap applicator nozzle. It has two 10 inch never-flat wheels for its easy movement without any obstacles. The device comes with a 25-foot high-pressure hose to give you a good stretch while cleaning. The item weighs around 57 pounds when assembled and the dimension becomes 24.4 x 18.8 x 35.4 inches. When you make the purchase and order for home delivery the weight of the total package becomes a little more than the device’s weight. Powerful Engine: The powerful engine delivers 2800 PSI of water pressure that is very close to a commercial pressure washer. While cleaning you don’t have to take any tension about doing a tough job as the pressure you will get will be pretty high. Generac 6922 2800 PSI 2.4 GPM Pressure Washer easily cleans all the dirt from your cars, motorcycles, RVs, fence, walls and many more. Convenient Detergent Tank: With the integrated on-board ½ gallon detergent tank you can easily carry the detergent. It gives you relief from carrying an unnecessary bucket for storing the detergent. Ergonomic Spray Gun: The spray gun has a very comfortable grip so that you can use it conveniently and it avoids any kind of fatigue. The hose easily connects with the spray gun and the different nozzle tips fulfill your various requirements. Warranty: To protect your valuable investment the Company provides you 2 years of warranty. If you face any problem or if you find any manufacturing defect the Company will solve your problem free of cost within this two years. Some of the users have raised the concern that plastic material has been used to decorate the hose which might wear off on daily usage. You can easily use or take another hose if you like. If you compare the price with the advantages you will get Generac 6922 2800 PSI 2.4 GPM Pressure Washer comes at the top of your pressure washer list. The machine has power, strength and durability as you desire for giving you a smooth cleaning. The machine solves all the problems starting from an easy to a heavy duty cleaning. You can easily depend on Generac Company. The Company has been making pressure washers for years. They have become a very renowned manufacturer. All the features and the facilities that the device provides place it among the top pressure washers in the market. I love all aspects of my Generac 2800 washer with one exception. The engine stalls out and won’t start again for a long time. Sometimes I just leave the job til the next day. (Still recurs the following day.) first time it happened I thought it had run out of gas, but the tank was still half full. Any suggestions would be greatly appreciated. Thanks for the comment. 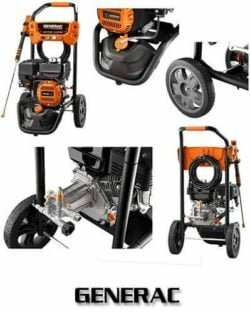 If your job is not done with this pressure washer, then We would like to suggest our editorial choice which one is the best for cleaning tough job. This is the one SIMPSON PS3228-S 3300 PSI at 2.5 GPM Gas Pressure Washer which will give you the best cleaning service for the toughest job. Works extraordinarily. No issues or concerns. after 2 years, water beginning spilling from the handle. I reached the organization and the sent me gaskets at no expense! real reward! This is an incredibly awesome item and the cost is exceptionally sensible. It is little, primarily for home utilize like washing car or driveway, however, it is excellent and takes care of business. I exceedingly suggest this power-washer. Thanks a lot, Ronald. It will appreciate other users to take the buying decision for their cleaning tasks.